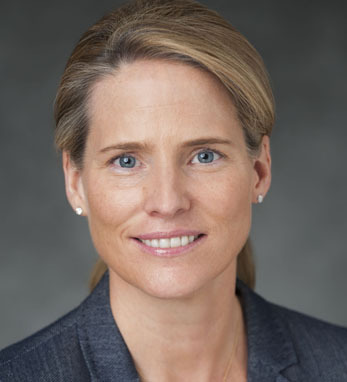 Kathleen McCabe is the Global Head of Investor Relations for Morgan Stanley. She also serves as a member of the Firm’s Management Committee. Kathleen joined the Investment Banking Division at Morgan Stanley in 1998 and was named a Managing Director in 2006. Before joining Morgan Stanley, she began her career at Bankers Trust in its real estate investment banking group. Kathleen serves on the board of trustees of the Morgan Stanley Foundation as well as Youth INC, where she serves as Co-President. She is a past trustee of the George F. Baker Scholars Program at Georgetown University, where she earned her B.A. in government. Both of Kathleen’s parents are from County Leitrim and she is an active supporter of the American Ireland Fund and the Irish Arts Center in New York City. Her heritage has given her “a deep commitment to family and faith, a strong work ethic, and a sense of humor.” She and her husband Dana LaForge have two children.